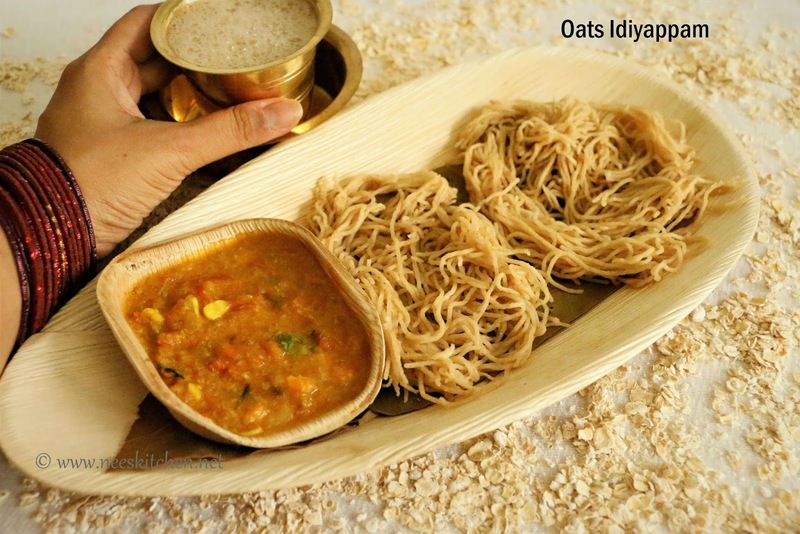 Idiyappam is a famous dish in South India. Traditionally it is made with plain rice flour but I wanted to make it with oats to make it healthier. Oats flour is mixed with little rice flour and made as a pliable dough. The dough is then placed in idiyappam maker to make idiyappams. It is then steamed for 5 minutes. 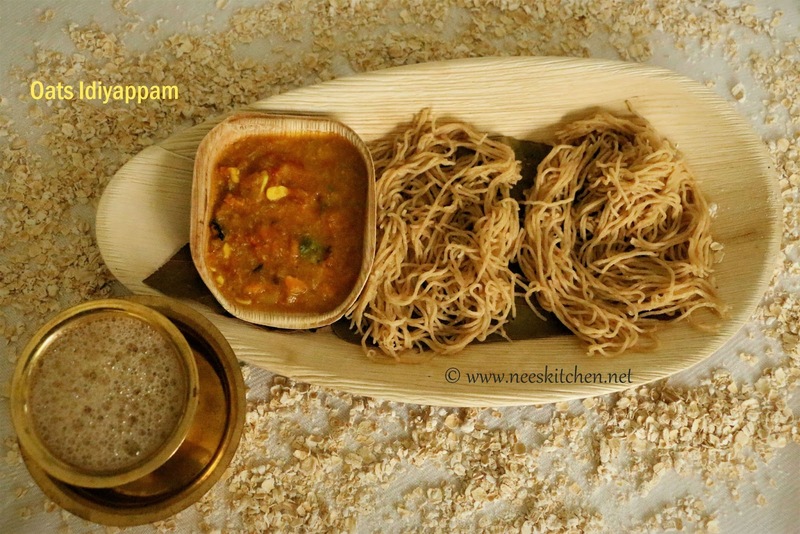 We do not prepare idiyappams often at home, simply because we are not much used to this recipe. However, off late I started to make this at least weekly once as all of us at home started to like this dish. I thought I must start giving a twist to the regular one’s. 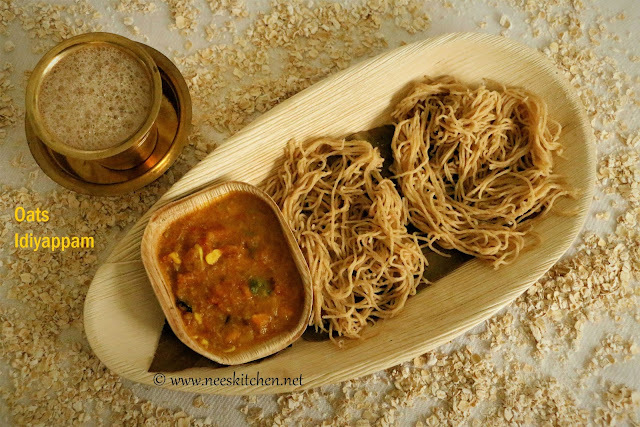 Most of the non-rice based idiyappam’s requires us to first cook as idly and then use the idiyappam maker to make it as an idiyappam. I wanted to try more simpler approach. The first such one is with oats flour. If we add little rice flour to the oats flour then the approach to make the idiyappam is the same. However the main point to note here is how smooth is the dough. If the dough is hard, it would bend the idiyappam maker plate. It happened to me and I had to fix it after that. The biggest advantage on the other hand is the cooking time which is almost equal to the regular idiyappam cooking time. If we prepare oats flour well in advance then we save much more time especially during working days. The video shows how to make the oats flour and keep it handy. 1. Grind oats to a fine powder and sieve. Make sure it yields up to 1 cup for these measurements. Some oats variety might yield slightly lesser. 2. Take a bowl and add the oats powder, rice flour, oil and salt. 3. Heat the water (Not boiling) and add little by little to form a piliable dough. Refer to my video. 5. Steam for 5 – 8 minutes. 6. Serve hot with kurma or any side dish of your choice. 1. Do not put boiling water in the oats mix as it would cook immediately. 2. Add water little by little to make it a pliable dough. If the dough is too tight or hard it would spoil the idiyappam maker.